After we complete a lapbook there is always the question of "How exactly do we store this...and where?" At times I've filed it in along with the kid's schoolwork records, or put them on the bookshelves to look at, but this year as we lapbook along with our geography studies we've been doing a little something different. And it involves duct tape (oh, yes!). 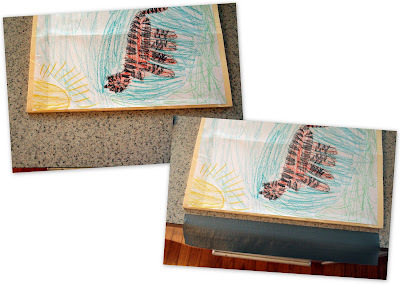 I came across this idea somewhere in the wonderful bloggysphere (thanks to CouponSista for pointing me to the post New Use for Duct Tape at View from the Hill). 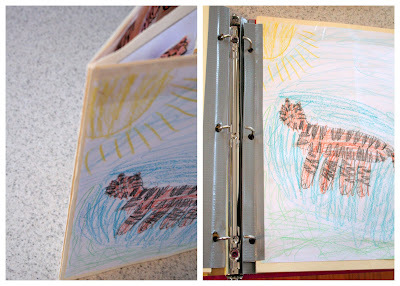 This idea is great and has allowed us to store our lapbooks along with our notebooking pages, so we LOVE it! 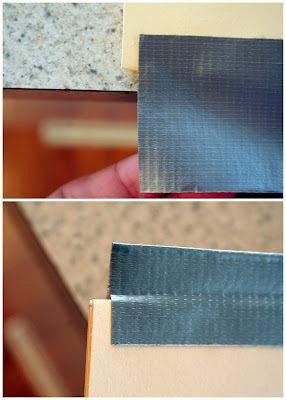 ~ Cut a piece of duct tape that is about 1/2" shorter than the length of the lapbook side. ~ Stick the duct tape to the side of the lapbook, leaving enough room to double the duct tape back and still have a bit of a 'lip' of sorts. This will be the edge that you use the 3-hole punch on. ~ Use a 3-hole punch on the side with the duct tape and put it in your binder - simple, isn't it? I've read this idea before (sorry, can't remember where). But your crystal clear step by step pics add a lot to the idea! Well done! It's been linked on both Lapbooking and Lapbooking FAQ. Very useful information. We just made our first and finished it yesterday. Now, you have answered the question of storage for us! Thanks!! What a great idea. Thanks for sharing that! This is a great idea...we have been storing them in a magazine file box. I like that my girls can get them out and re-explore them on their own...and they do! we are just starting lapbooks and this family loves duct tape! thanks for the tip. i found your site by Lapbooking FAQ. Wow, its funny I saw this on your site first. But I think I may have found where you got the idea. http://littlehomeschoolonthehill.com/2008/03/19/new-use-for-duct-tape/. When I saw it I immediately thought of you. I just also want to say I love your blog. It's awesome. I've found CLEAR duct tape that will be perfect for this! Thanks for the tip! I got to be her tester-way fun. HTH ya out.